When you get an email telling you have a comment on your Blogger post, have you noticed that you can reply to the authors of some of them and others you can't? In the former case, the commenter's email address pops up when you hit the reply button on your email program. In the latter, you get the dreaded "no reply-comment@blogger.com" instead of a valid email address. While Blogger has some great features, it is frustrating in that it does not include adequate information about setting it up so that people who comment on your blog can receive replies from you. The default setting is for this important feature to be disabled and, in my view, that is not adequately explained. There is a feature within the comments section at the end of each post for me to reply to a comment, but it is highly unlikely that the commenter will return afterward to see if I replied, so I generally don't bother to reply there. The other, more workable, option is for me to reply to the commenter via the email I received from Blogger announcing the posting of the comment. Unfortunately, I can't do that if the commenter's Blogger profile is not set so that he/she can receive emails in this way. Of course, there will always be some folks who are a little reluctant to have their email address visible anywhere, so they will not be interested in changing this setting in their profiles. So, if you would like to receive replies to your comments--and I hope you do--the procedure for setting up your profile can be found here. Please consider taking advantage of this and help spread the word. Tell your readers their comments are important and that you would like to have the privilege of responding to show your appreciation. Yesterday was the final day for work on Phannie on this trip to Red Bay. Goodness knows, this has been a marathon event but very productive in fixing Phannie's issues and adding some goodies that we wanted. We drove Phannie out to Chris Wright's body shop behind his nice home in Red Bay so he could dress up and paint the exhaust fan housing that Brannon at Custom RV installed last week. Chris, like all the service providers we've encountered, was very personable and obviously skilled in his craft. We couldn't be more pleased. Just as Chris finished his paint job, Chris Berry showed up with a modified cockpit tray table and a new shelf for the cabinet under the stovetop. Chris is a master woodworker with a shop at his rural home where we left the tray table a few days ago to have longer extensions added to the drawer slides. 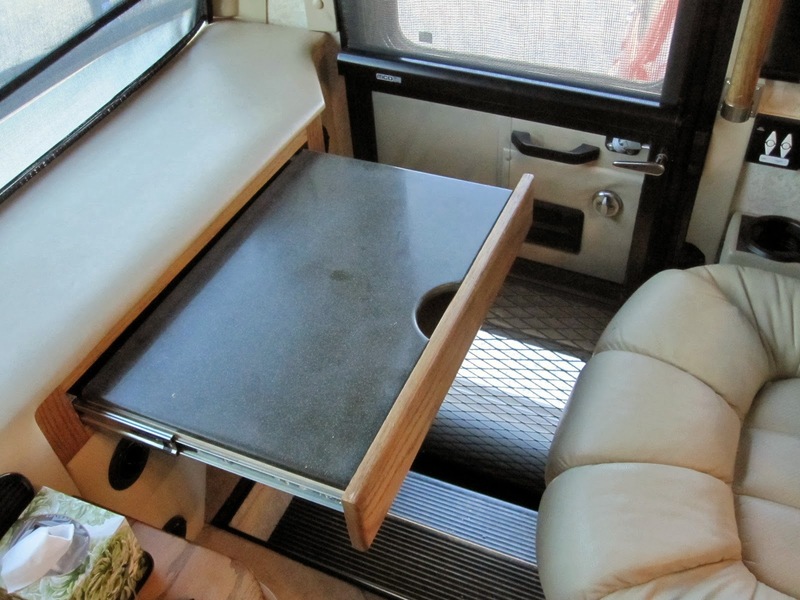 As originally configured, the table could be pulled out for the copilot to use, but not far enough to access it without bending forward uncomfortably. We added this to our list of factory design missteps that should have been obvious (remember the wood floor under the wet bay?) in an otherwise fine motor home. We had to wonder if the designer had even occupied the seat and attempted to use the table before production commenced. Although I didn't include a photo of it, Chris Berry also installed a middle shelf in the cavernous storage cabinet under the stove top. Without the shelf, the upper portion of this cabinet was just wasted space. This was another simple, low-cost addition that, in our opinion, should have been installed during production. Chris Berry; he installed the shelf in the cabinet with the open doors. We had an extra treat in the afternoon when we dropped by Richard and Patsy King's Allegro Bus, parked at the Tiffin campground and waiting for service to some minor issues with their coach. 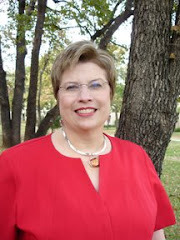 We are mutual blog readers (find theirs here), and we enjoyed a lively and laughter-filled chat after meeting them. Today will be our last full day in Red Bay. If the rain stays away, we will likely get a wash job for Phannie before the trip home. 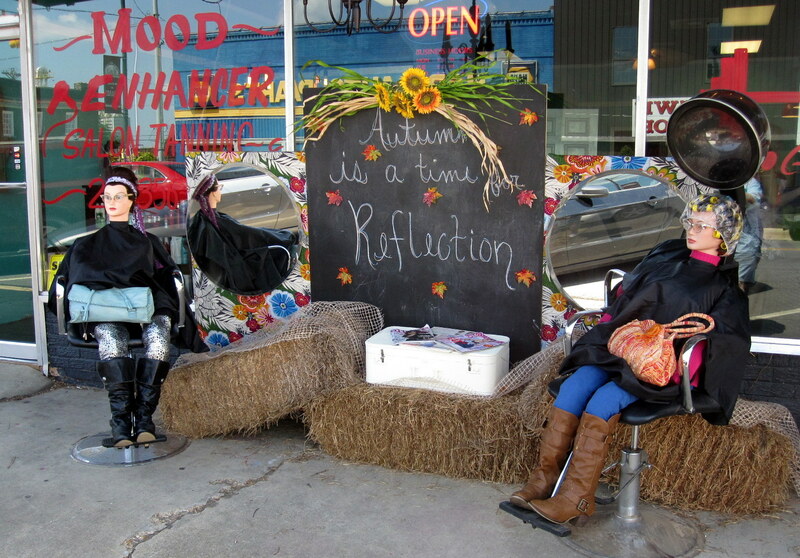 One of the marvelous things about small towns is that interesting and quirky things seem more visible. Or, it could be that I'm more observant of my surroundings than when I was racing to and from the office in the daily demolition derby known as rush hour. Regardless, I've included below a few more things that struck our fancy here in Red Bay. Off topic for a moment: You will notice that I include a small subheading at the beginning of each post identifying where we are. (This is admittedly not difficult to discern at the moment, for we have been in Red Bay so long that everybody who reads this already knows. Lord knows, we have watched local kids grow up, get married and have children of their own. Well, almost; I exaggerate only slightly.) I began including these little location-identifying subheadings after reading so very many posts by other bloggers describing some event or attraction that I found interesting but unidentifiable as to where the writer was located. Sometimes I am forced to go back many posts to get a hint of where they were when they were writing the post. Most of the time, however, I just click on through, that bit of curiosity unrequited for all time. By being respectful toward you, dear reader, and always showing our location, I will hopefully not contribute to a similar frustration on your part. Since we have finally exhausted our list of services that we wanted done at Tiffin, we are now in the final stretch. We have a few more items that will be accomplished by local craftsmen who make their living performing work that overflows from Tiffin. 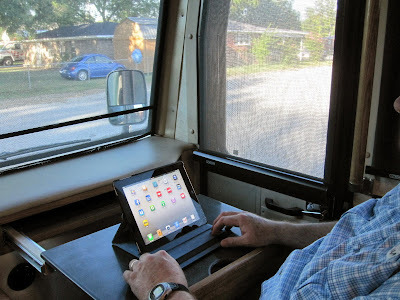 In most cases, these services can be performed more quickly and less expensively than that available from the factory, and the providers stay very busy poaching among the generally well-heeled and captive motorhome owners. At any given time, there are about 30 million dollars worth of motorhomes milling about this tiny town, and you can bet that something is broken on every one of them. It's like shooting fish in a barrel. On this day, we drove out to nearby Vina, Alabama to have Phannie's kitchen exhaust fan rerouted to the exterior of the coach. 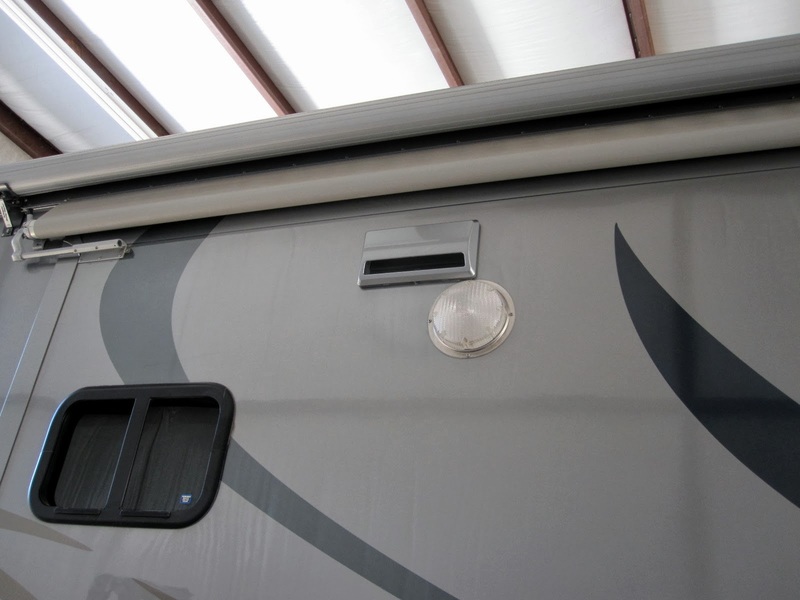 For several year models, including ours, Tiffin elected to build their motorhomes without an outside opening for the kitchen exhaust fan. 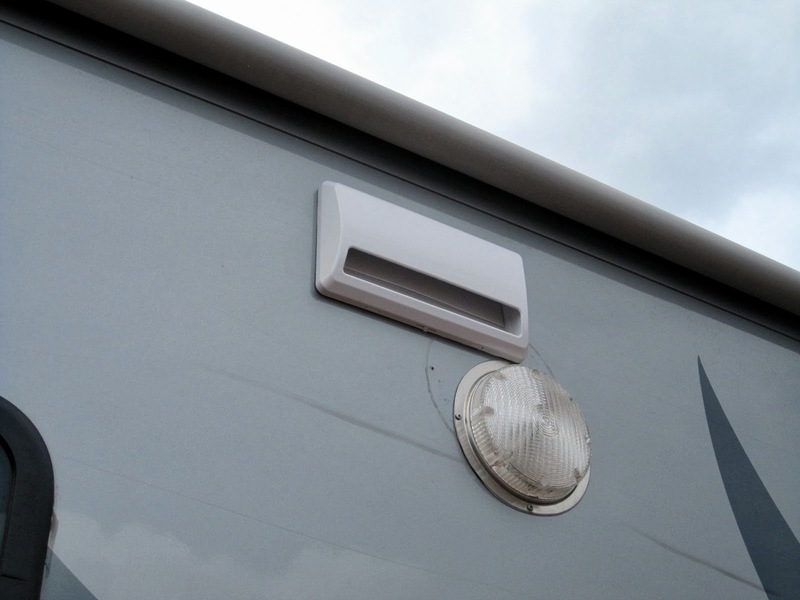 The microwave/convection oven contains the fan itself and can be configured for the exhaust to be vented outside or simply to recirculate inside the coach after being pulled through a filter. This latter arrangement was totally unacceptable because of the fumes and smoke that would naturally aggregate within the small confines of the coach. As often as not, the smoke alarm would be set off if any serious cooking took place on top of the stove. 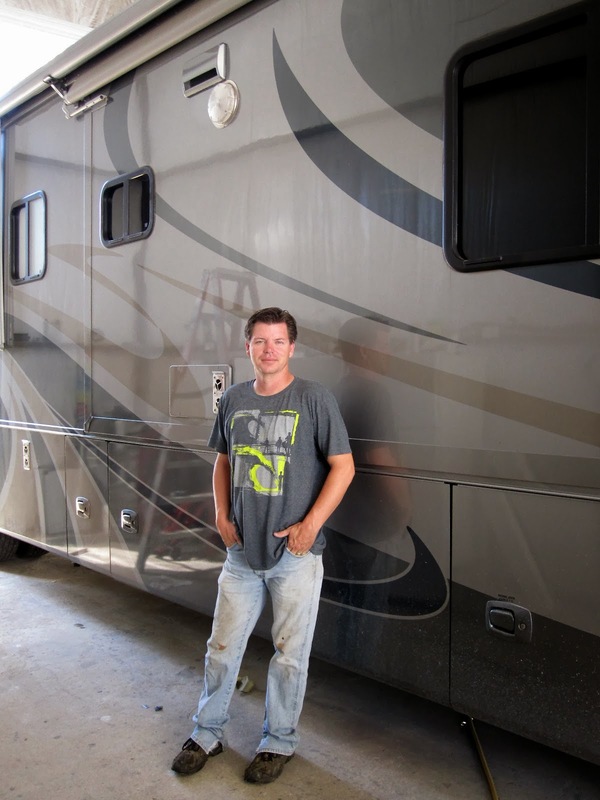 Brannon Hutcheson owns Custom RV in Vina, and he was kind enough to squeeze in this small job among the larger ones that he has had booked for months. 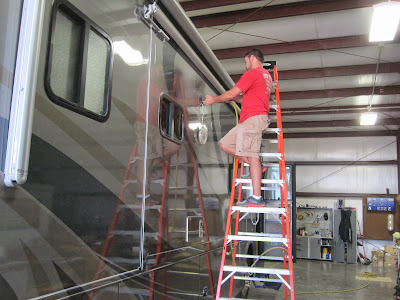 You will note that Brannon had to move the exterior light to install the exhaust housing. In a couple of days, we will take Phannie to Chris Wright's body shop here in Red Bay to have the vent and the area around it refinished and painted. Surprisingly, we were called to bay 44 the next day after the windows and the other punch list items were completed. Tiffin has dedicated bays 44, 45 and 46 to the recall fix of the wet bay floor. Two techs went right to work removing all the tanks and the wooden flooring. Like most Tiffin motor homes built roughly between 2005 and 2010, Phannie's floor was a rotten mess. Replaced with a plastic-fiberglass composite floor, there will be no more problems with her wet bay floor. There was an added bonus--the workers found the leak! When they removed the tanks, it was obvious that the shower drain plumbing had been leaking. The water from the shower had been leaking down around the tanks and onto the wet bay floor, accelerating its deterioration and absorbing an unmistakable 'aroma' in the process. The techs quickly dispatched the leak, replaced the floor and reinstalled the tanks. Good as new! Here's a photo of the remnants of the old wooden floor. How could the designers possibly have thought wooden flooring in a wet bay was a good idea? After paying our bill, we drove Phannie back to her parking spot at the Tiffin campground for her last night there. The next day, we will be moving to the overflow campground down the street while the remainder of Phannie's non-Tiffin upgrades are completed. After more than two weeks, we were glad to be moving on from here. One of the obligatory activities while we were growing old at Red Bay is a Tiffin factory tour. These are conducted every weekday at 9:30 a.m., beginning in the customer center near the main gate. Leading our tour were two guides, a woman who had a real gift of gab and a somewhat younger man who took over the monologue whenever technical subjects were at hand. Both were retired teachers. The tour was very informative and remarkable in that the group just sort of strode through the plant, mingling at several points with the workers, who seemed perfectly comfortable with a group of strangers in their workspace. The employees building the rigs were friendly (again, the norm here in the South) and were happy to answer questions. Oddly enough, Tiffin will let you roam around the factory even when a tour is not being conducted and, if you are buying one of their coaches, you are welcome to observe its construction throughout the process on the assembly line. 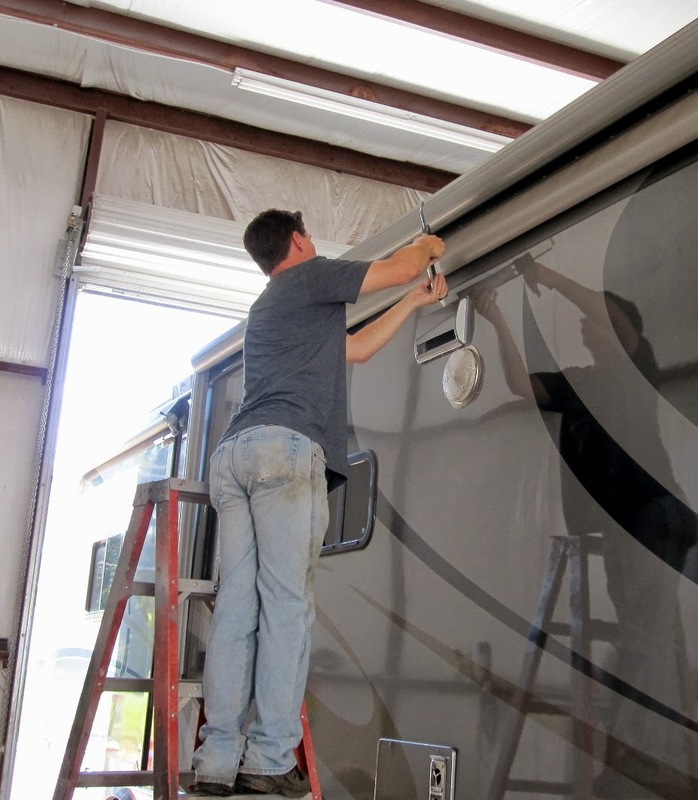 The tour lasted about and hour and a half and covered the building of a motorhome from the bare chassis to the finished product. There are three production lines functioning at present--two for diesels and one for gas powered rigs. 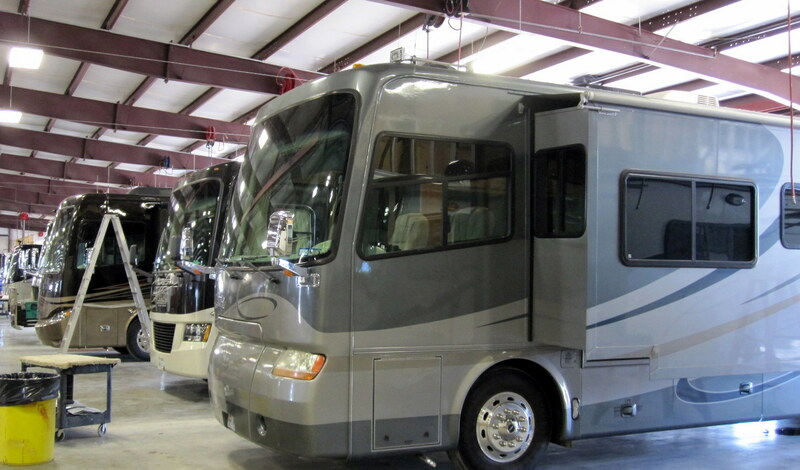 Tiffin currently produces about twelve motorhomes a week and is looking to increase production. Approximately 850 employees work directly for Tiffin; about 400 more are employed in support businesses. The factory consists of a sprawling complex on the north side of Red Bay and a paint facility in another nearby town. It gives the impression that it was built not so much from a plan but from many additions to older structures. In fact, the tour guides verified this as they pointed out the rather small area in one of the buildings that was formerly a cotton warehouse where the first Tiffin motorhome was built in 1973. That was about 65,000 motorhomes ago. While Tiffin is happy to show you around their facility, they certainly do not have their customer areas, the plant or the executive offices gussied up to impress anyone. The place is best described as utilitarian; no elegance is found here. Even the video at the beginning of the tour was woefully out of date and shown on one of those gargantuan projector-type TVs that were popular about 25 years ago. It seems incongruous that a factory so modest in appearance can turn out a motorhome with the rather striking elegance of some of the upper-end models they produce. The Tiffin tour was an interesting experience and a welcome diversion. 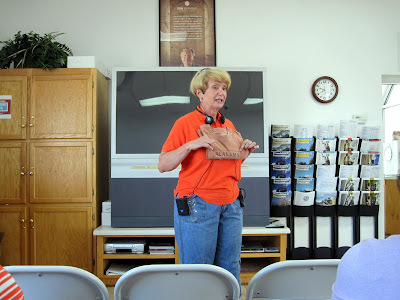 We thought about asking for a tour of Sunshine Mills, a dog food factory that was the only other major employer in Red Bay, but decided that we were not that desperate...yet. Finally, the call we’ve been waiting for! We had just begun to eat breakfast when my cell phone rang. It was the Tiffin service center manager, instructing us to drive Phannie into bay 9 as soon as possible. 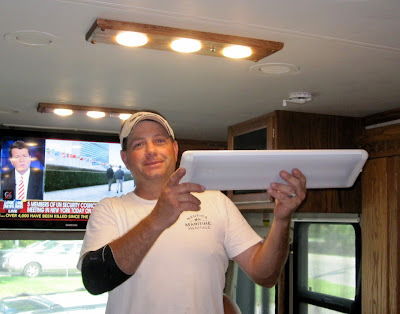 Well, ‘as soon as possible’ is a relative term when it comes to launching a motor home, especially when you have to clean up from cooking, prepare the interior by securing the loose items, move the furniture to make way for retracting the slideouts, retract the satellite dish, disconnect the water, sewer and electrics, etc. It’s sort of like launching a cruise ship--it can't be done quickly. Amazingly, however, we found ourselves ready and starting the engine in 20 minutes. That is some kind of record, I think! I drove into the express bay and two techs came aboard to talk about the punch list, which had about eight items. They worked through the list in about three hours, fixing everything we wanted, but oddly, they could not duplicate the leaking black tank. They filled all tanks with water and found no leak anywhere. I was at a loss to figure this out, and so were they. We decided to watch it while we were in the campground and then have Tiffin inspect the tanks thoroughly when they are removed in the next few days. Removing all the tanks is required to enable the wooden wet bay floor to be removed and replaced with a fiberglass composite version. Tiffin used the wooden floor in its wet bay floors for several years and found they didn’t hold up for this purpose. 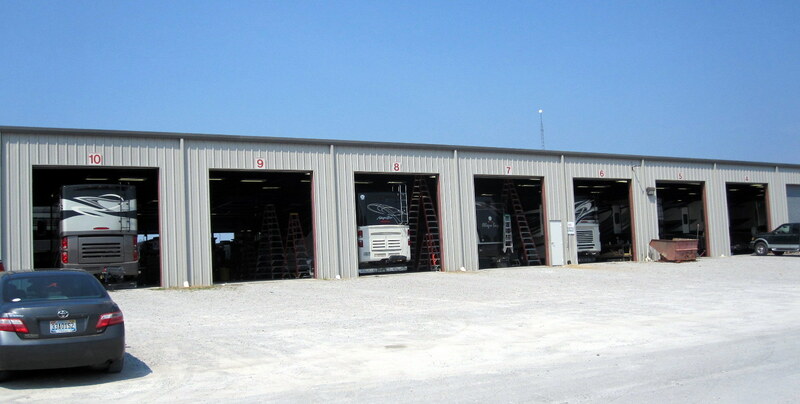 Bob Tiffin decided to replace them all at no cost to the owners. He did the same thing with the cap rails on some models. For several years, these rails--forming the longitudinal roof edges--were built with a seam that proved to be a source of water leakage during rainstorms. Phannie did not have this problem, thankfully. I thought this was a pretty impressive gesture on the part of the manufacturer because these recalls had to be costly. Among the items repaired today were the replacement of two windows that had become foggy when the seal failed between the two panes. It was nice to have the nice clear views again all around the coach. After we were turned loose, we drove to Russellville and had a pulled pork sandwich for dinner at the Speedy Pig Restaurant, then stopped at Wal-Mart. During dinner, Sandy, forgetting that pork was the barbecue meat of record in the South, was expecting a beef sandwich, but thought the pork was pretty good. Unfortunately, the Speedy Pig really doesn’t qualify for a recommendation. We will be standing by for another call in the next day or two. We’re beginning to see light at the end of the tunnel! Driving around Red Bay (an activity that doesn't take very long) reveals a few curiosities, a few of which I will catalog here. First of all, there is the post office. 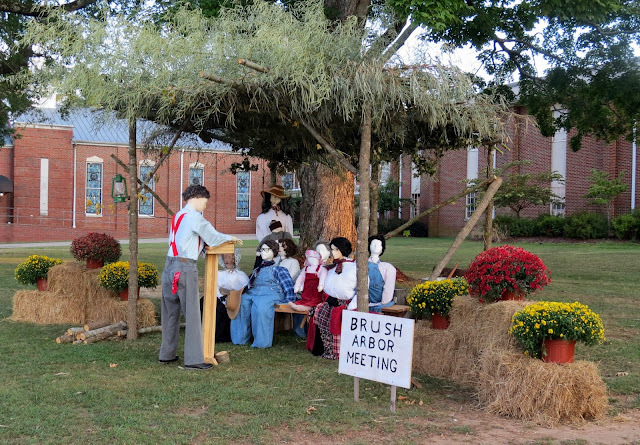 There is only one in town, and we were struck by the little vignette constructed near the building's entrance. 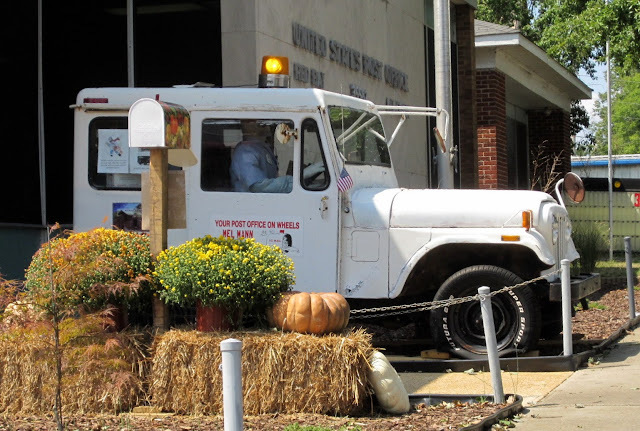 It consists of what appears to be a permanent display of a mail carrier's Jeep, obviously decommissioned, with a yellow rotating light on top. Inside the Jeep at the steering wheel is a dummy dressed as a mail carrier. On the door is a sign that reads: "Your Post Office on Wheels - Mel Mann." Now I'm not trying to pass judgment here on tasteful decor, but it is just not every day that you see Jesus and Mary, the Statue of Liberty, Donald Duck, Mickey Mouse, a hobby horse, Hansel and Gretel, and a racehorse and jockey on display in the front yard. I would love to have met the homeowners; I just know they would be interesting people. Some not-yet-retired friends back home who read this blog will chide me good-naturedly about this post, calling it evidence that my lengthy stay in this tiny place is slowly driving me round the bend. But I don't pay any attention to them. I can find amusement in simple things--ever more so, now that I'm retired. Wasn't it Thoreau who admonished us to "simplify, simplify, simplify?" Well, my observance of Americana is a simple pastime. So there; you're just jealous! 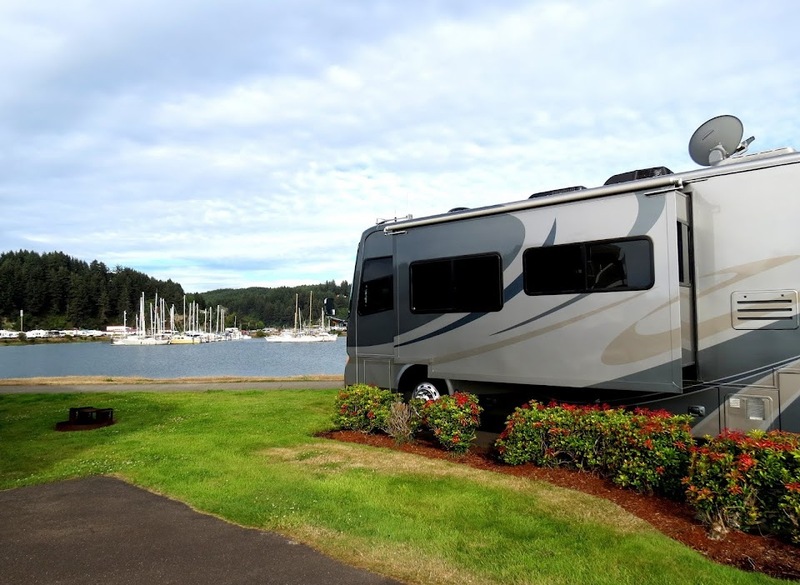 Like seagulls circling and soaring behind a fishing trawler, some savvy entrepreneurs have set up shop in Tiffin’s shadow here in Red Bay, and it is difficult to resist the services and products they offer to us motorhome owners as we wait our turn for factory service. As you may have read in the last post, we have already gotten an engine service from Bay Diesel, and yesterday was the installation day for some important upgrades for Phannie. Trevor Nichols is a local guy who has a good reputation for installing new carpets in coaches, and he recently began offering ceiling light upgrades for the older coaches (like Phannie) in which fluorescent ceiling fixtures had been installed as original equipment in one of Tiffin's weaker moments. I have a visceral dislike for fluorescent lights of any kind, and replacing Phannie’s with LED fixtures was a “must have” during our stay here at Red Bay. I gave Trevor a call and made a deal with him, and he needed only a couple of days to build the fixtures and matched Phannie’s wooden cabinetry. 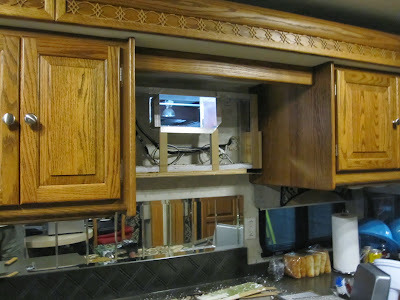 We also had the same lights installed under the kitchen cabinet. What a difference! 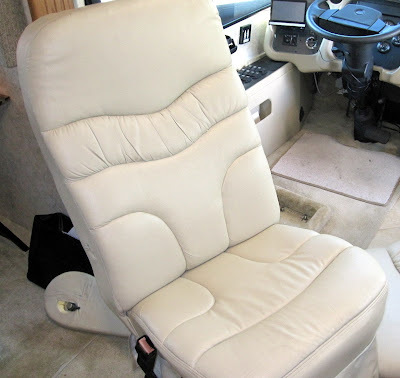 I have wanted to upgrade Phannie’s cockpit seats for some time, but I just couldn’t bear to shell out the $3500 it would have taken to install top-of-the line Flexsteel chairs. Trevor had a line on a couple of these chairs that had been removed from a new Allegro Bus, and I was able to get them at a low fraction of their cost new. Another lucky break, thanks to Trevor. Yesterday we drove Phannie out to Bay Diesel for its annual engine service check, which included an engine oil change and replacement of the oil and fuel filters. I also asked them to check the belts on the engine. They found one that was suspicious and changed it, after which they lubed the chassis. I was very impressed with their work. Bay Diesel; not much to look at, but very competent folks. Bay Diesel is only one of a number of service centers of various kinds that have formed a cottage industry here in Red Bay to support the vast number of motor homes that transit this place, and we will be making use of several of them, as you will see from future posts. Due to its run-down appearance, we would just have driven on by this place, assuming it was abandoned, if we had not heard about it and read about it in the Tiffin forum. Once inside, we received a friendly greeting (as we always do in these parts) from Edna, our waitress, and another woman whom we assumed was the cook. We had come for breakfast, which was wonderful and cheap, the highlight of which were the homemade biscuits, which were possibly the best we have ever eaten. I would go back there for the biscuits alone! We also enjoyed the primitive wall art, a photo of which I included below. I get the alligator/chef (the alligator's chef outfit is not easily discernible) and the order ticket carousel, but I can’t quite figure out the dead bird lying in the plate. 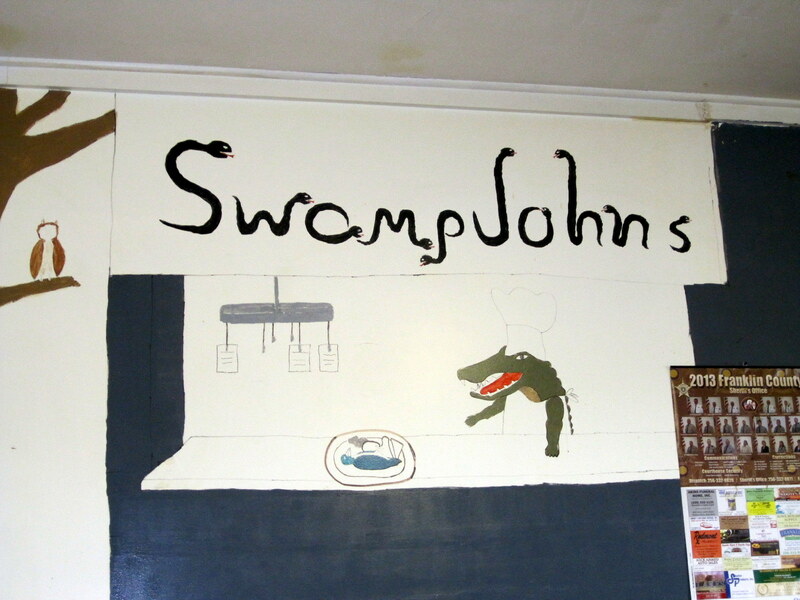 “Swamp John’s” spelled out with snakes is something I don’t think I seen anywhere before. I liked the art very much, but I couldn’t help but wonder at the mindset of the artist. He or she could have been any combination of genius, whimsical or troubled. Of course, the same could be said of yours truly, whose musings about it probably lean more toward troubled. I was also struck by the adjacent wall calendar, proudly showing the local county sheriff and all of his deputies. This is obviously a law and order place, and I got comfort from that. Another bit of serendipity was the appearance of "chocolate gravy" on the menu. We had seen this at other local restaurants, so I asked Edna about it. She said it was a fairly popular item, generally poured over biscuits. Naturally, we had to check this out, because that combination would seem to be an acquired taste. It was. The chocolate gravy was the consistency of thin chocolate pudding. The biscuits and chocolate gravy were good by themselves, but we just couldn't figure out the appeal of pouring the chocolate over the biscuits. Oh well.. Swamp John’s -- great quirky charm and great southern cooking, done on the cheap. Don’t miss it! On our first day after arriving in Red Bay, we had a DC electrical failure on Phannie, the result of a previous issue that was among the reasons for our maintenance visit to Red Bay. One of the items on our discrepancy list that we handed to Tiffin was the possible replacement of the inverter remote panel that reveals the health of the electrical system and provides control of the inverter from the cockpit. This thing had been giving some crazy signals before departure from Fort Worth, commensurate with which was a constant indication of a low house battery level. What we didn’t realize was that the fried remote was not allowing the inverter to charge the house batteries using shore power. When we were en route to Red Bay, the engine alternator and genset charged the batteries, but after shutting down the engine and genset at Red Bay, the house batteries slowly discharged until all the DC items--including the refrigerator--died. 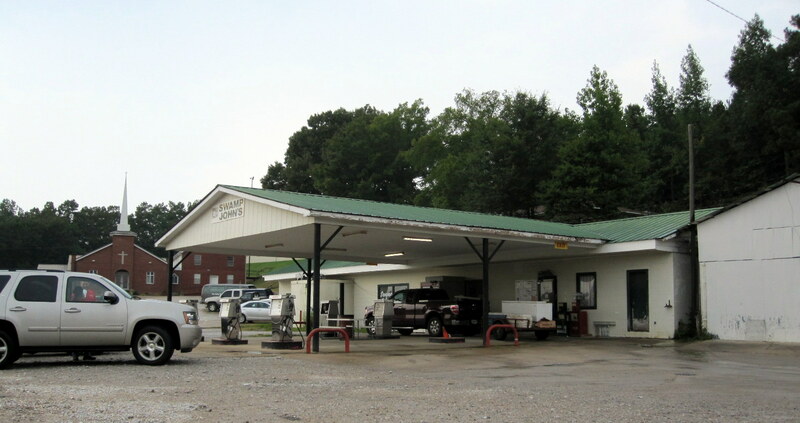 As soon as I realized what had happened, I jumped in Mae and drove the short distance to Tiffin’s service center. After telling the service manager of my plight, he grabbed his two-way radio and dispatched a mechanic to Phannie’s parking spot. Although I immediately got back in the car and drove there myself, the mechanic, much to my amazement, had already arrived ahead of me! After a bit of troubleshooting, he replaced the inverter control panel and announced that the battery charging solenoid was also bad and would have to be replaced once we got into a service bay. To say that i was impressed with Tiffin’s instantaneous and effective response to my plight would be an understatement. With a hundred or so coaches waiting in line for service, they didn’t hesitate to pull a mechanic away to take care of our little crisis. We felt so fortunate that this problem occurred within a few blocks of the service center, and Tiffin’s response couldn’t have been any better. Junior Barrett’s melons? 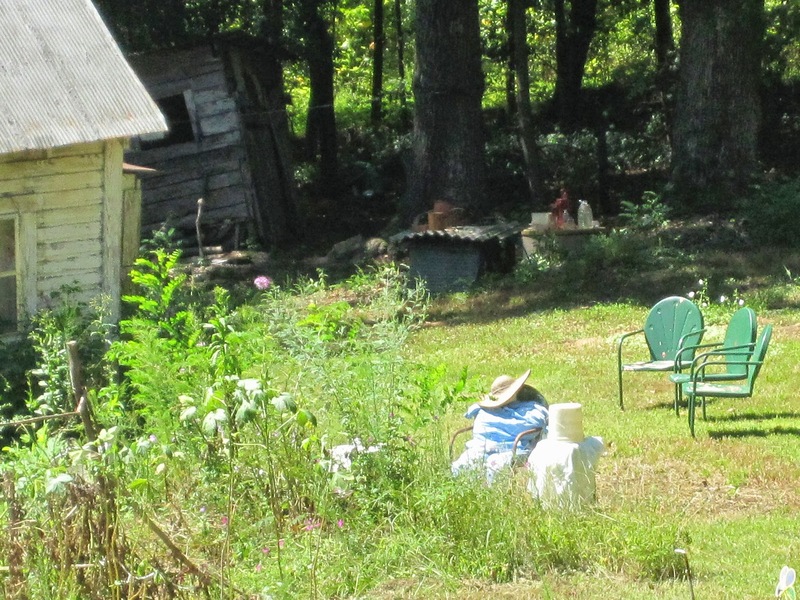 Sandy and I looked at each other and marveled at this little homespun vignette. I asked the clerk about the melons, and she said that Junior Barrett was legendary in the area for growing fine watermelons (nearby Russellville is the watermelon capital of Alabama), and he left this cartful with the store manager to sell for him. Well, I wasn’t about to leave there without trying one of Junior’s melons, so I heaved one into our cart and gleefully returned to Phannie to see if the clerk’s story had merit. I must tell you that it did; it was one of the best watermelons I have ever eaten. After chomping down about ten good sized bites, I cut the remainder into sweet chunks of goodness and stuck them in the fridge for later. I had read a lot about the Red Bay experience for Tiffin motor home owners, but I still wasn’t quite prepared for it. The town is a sleepy little burg of some 3500 souls, most of whom doubtlessly are employed by Tiffin. After checking in at the factory service center, we were placed in the queue with about a hundred other Tiffin coaches that were lined up in rows along an abandoned airport runway. The local airport was closed and swallowed up by Tiffin, but still more room was needed to accommodate the visiting coaches. An overflow area was created a few blocks away, and it was in this lot that we were assigned a space, joining eight other Tiffin motorhomes waiting for service. 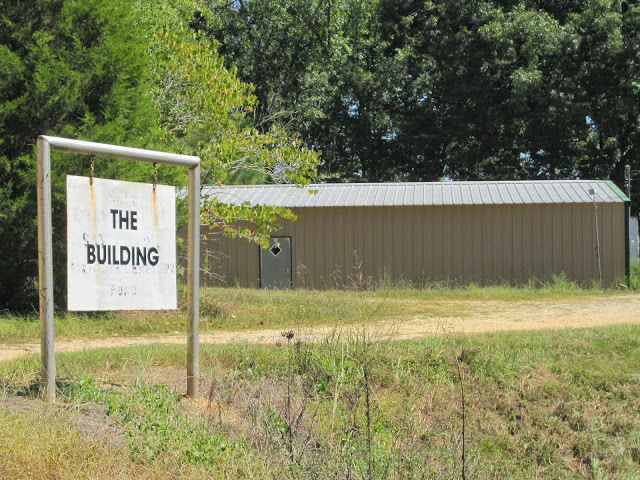 Upon arriving in Red Bay, we followed signs to the service center and checked in at the office. A small part of perhaps 100 Tiffin motorhomes parked for service. See the old runway? Tiffin's response to customer demand for service at the factory has been amazing. 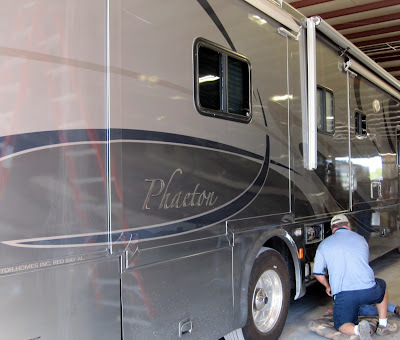 No other motorhome manufacturer I can think of has devoted 42 service bays exclusively to motor home repairs. Also amazing is customers' willingness to accept waiting onsite perhaps as long as month for their turn to pull into a service bay, all the while living in their coaches lined up on an abandoned runway in the middle of nowhere. Given the demand for instant gratification among most of society today, this laid-back phenomenon at Red Bay is not easy for me to figure out. I think the only explanation is that Tiffin is renowned in the industry for standing behind its products, and this long queue of customers patiently standing by is a testament of their desire to have the work done by friendly factory service techs who know what they're doing. Most have worked for Tiffin for decades. 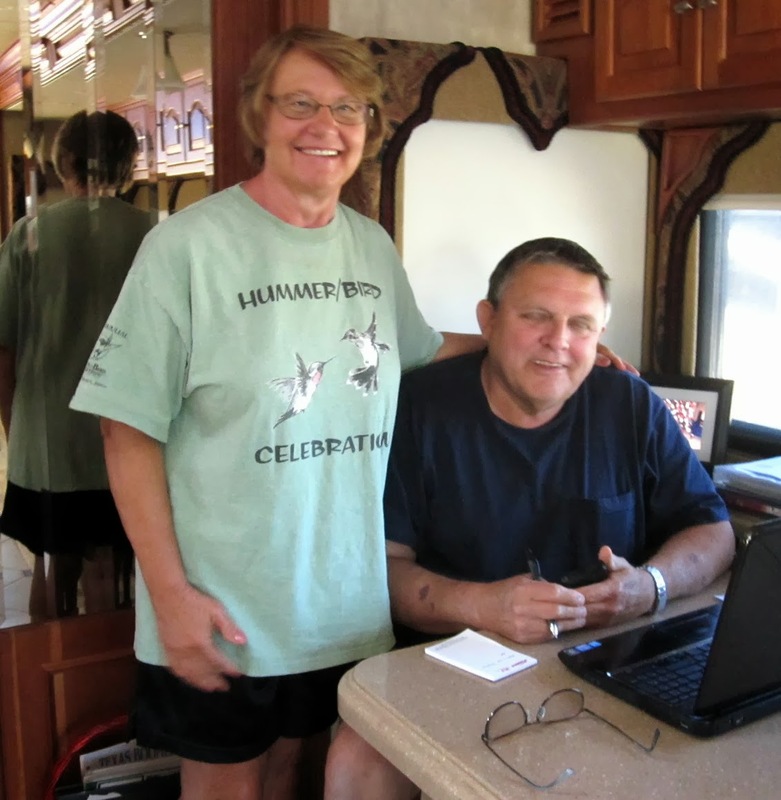 Another contributing factor is that most of the owners of these motorhomes are retired (like me! ), thereby having more time on their hands than most younger folks who are still in the rat race. Another surprise is that the owners usually don't have to exit their coaches during service! 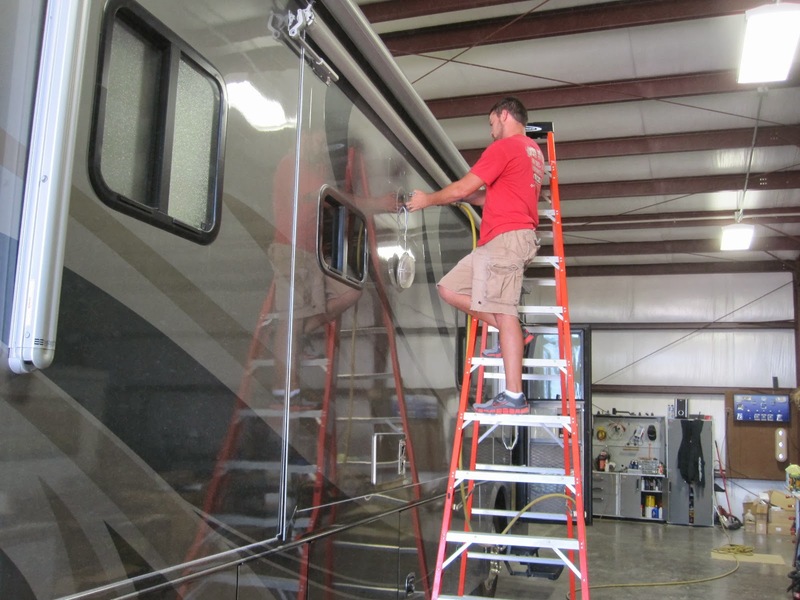 In fact, Tiffin encourages owners to watch the techs as a means of learning more about their motor homes. The techs are perfectly comfortable with owners' wandering around in the work area, watching what is going on and conversing with them. Frankly, I've never heard of this being allowed anywhere else. This sort of unconventional thinking comes from Bob Tiffin, the legendary but unassuming patriarch of the family who owns the company. He maintains an office at the factory, and his door is always open to customers. 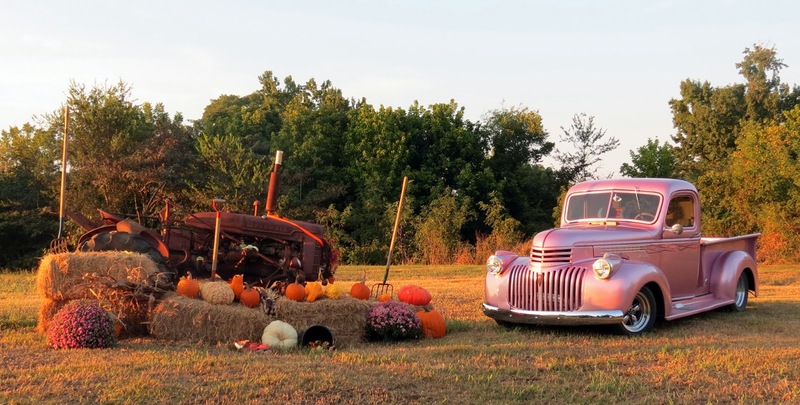 Because of the folksy way he does business, taking personal interest in every customer he meets, he is generally revered by Tiffin owners, for whom he often makes special repair cost adjustments for chronic mechanical problems. 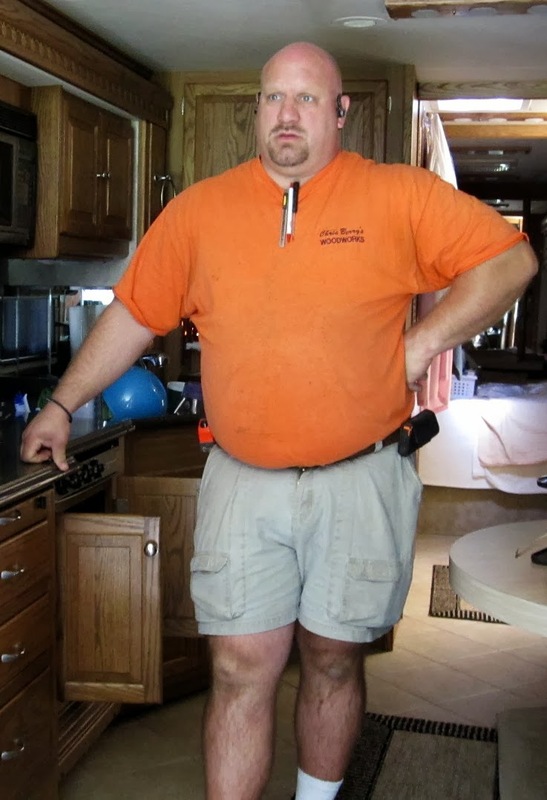 His willingness sometimes to absorb some repairs--even for rigs that are well out of warranty--has earned him a very loyal following of his brand. Bob Tiffin is a pretty smart guy, in my book. Memphis was just an overnight stop for us en route to Red Bay, so we didn’t plan any sightseeing. 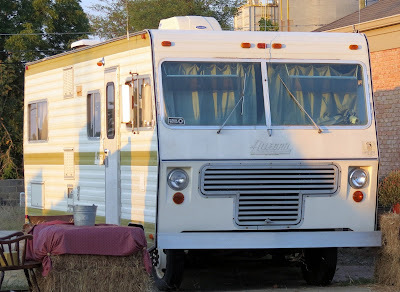 We chose the Tom Sawyer RV Park in West Memphis, a rather unique park right on the bank of the Mississippi River, mentioned in many of the blogs I read. The entrance to the park was a little spooky, but we enjoyed our campsite, which was just a few steps from the riverbank. We sat there and watched the river traffic as the tugboats threaded their way around the sand bars. The water level of the river was extremely low, perhaps as low as we've ever seen it. Although clearly not in Texas, Sandy displays Texas pride with her purse, don't you think?. Since we had earlier done a tour of Graceland, about which I’ve already posted, we decided to eat at Gus’s “World Famous” Fried Chicken, an iconic joint in downtown Memphis. Typically, we like to try new restaurants during our travels, and fried chicken sounded good. However, I really should have reread that earlier post, because it was obvious when we saw the building that we had already eaten at Gus’s during the earlier trip! Admitting this memory lapse is a trifle embarrassing, but I suppose we are not alone as we get older. I often tell people that I have a great memory, but it is extremely short! We decided to go ahead and give Gus’s another try, because we didn’t remember whether we liked it the first time. (Gosh, this memory-loss thing is getting painful to write about.) The verdict: The chicken was hot and tasty and very spicy (which I loved..Sandy not so much), but we thought it was way overpriced. The price issue was probably our perception during the first visit, but we didn’t remember that either. Egad! Fried green tomatoes at Gus's; we must be in the South! After eating, we were pleased that we remembered where Phannie was parked, so we viewed that as something positive and skulked back to Tom Sawyer, now more mindful that, although getting older means getting wiser, it also means getting more clueless. What’s-her-name thought so, too. Since we haven’t had the option before of preparing for an extended RV trip with no firm ending date, we were a bit unsure of how much “stuff” we should take. For Sandy, “stuff’ equals clothes and shoes, and it is always a mystery. Sandy insists that, due to the existence of a vast undefined conspiracy, the clothes and shoes she chooses will always be the wrong ones. So, I made what I thought was a logical suggestion: Take only those items that she knows are inappropriate. She’ll be sure, then, to have the right ones. This was met with an icy stare, followed by hands on her hips and then a general admonishment against my ever verbalizing a thought again. After much of what I assume were meditation and prayer in her closet, she chose a collection of outfits that I dutifully loaded into Phannie, wisely without further comment. Surprisingly, the items she chose occupied slightly more than half of the available closet space, leaving more than enough room for my things, which numbered about a dozen and were selected in about five minutes...but who’s keeping score? Food items are my responsibility. In dealing with food, I think it is much easier to be a full timer than a part timer. Since we don’t leave any perishable food in Phannie between trips to help reduce the likelihood of spoilage and pests, we must refill the refrigerator and restock missing items from the pantry before each trip. We wind up transferring all of the perishables from the house fridge to Phannie at the beginning of a trip and vice versa at the end. I try to guess what pantry items will be needed, but this is not hypercritical, as we don’t do boondocking in the wilderness; there are always grocery stores around. Neither of us likes to be very far away from all the amenities that civilization has to offer. In consideration of the above, departure day went surprisingly well. We left a trifle later than usual but traversed quickly the short leg on I-30 to Texarkana, arriving in the late afternoon at Shady Pines RV Park, perhaps one of the most manicured places we have ever seen. An uncut blade of grass would die of loneliness here, and it was a bargain at $25. 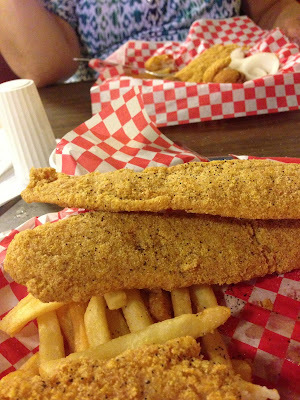 After setting up, we enjoyed a fine catfish dinner at Wayne’s Family Cafe, a real hole-in-the-wall place where the people are friendly and they know their way around a deep fryer. So like me to take a photo of the food and nothing else today. How lame is that? On the road again...and retired to boot! It was a good day for sure. Another bonus of retirement is finally having the opportunity to take care of those piddling little chores that I put off because of lack of time or energy--since those things were always usurped by work. One of those nagging chores was a cleanup of my desk area in our study. I won’t show you a ‘before’ photo because it would be too embarrassing. It should suffice to say that the surface area was not recognizable before starting the project. And now, voila! My desk has never looked better, and the sense of accomplishment is a rush. 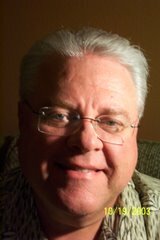 (I know, it’s not that big a deal but, for retirees, whose influence in the business world is largely over, we celebrate small things.) See how quickly I’m adjusting to my new life? Small pleasures abound in retirement. The nefarious alarm clock that has controlled the beginning of my day for decades sits there, mute and dejected, as if it knows its sadistic six o’clock ritual has been banished forever. I simply arise when it suits me now. Sandy and I can have a leisurely breakfast or, if there’s some adventure waiting, we can get going quickly and grab something on the road. And under no circumstances do I allow my route of travel or the timing thereof cause me to mingle with the several hundred thousand commuters in the demolition derby known as rush hour on the DFW traffic arteries. Only a week ago, I was among these poor slobs, grinding my teeth and hoping my defensive driving skills would be adequate to save me from any number of zombies talking on their cell phones or even texting as they hurtle mindlessly along the interstate in their two-ton projectiles. I had heard that the date and time of day become less relevant to retirees, and it is indeed true. It is almost a given that I will pull out my cell phone now whenever I have a need to know the date or the day of the week. One of the most popular items available online to retirees is a clock with only the days of the week on it instead of the time. I think I need one. When I need a nap, I take one. I used to take naps at the office, too, but they weren’t necessarily intended. One bright note is that the older you get, the more likely your coworkers are to overlook the old guy who nods off occasionally. This only gets really embarrassing when you are in a meeting in which you are the featured speaker. I wonder if I will reach a point in the future when I will renounce this slothful existence and make something of myself?